Dennis Palmer of the Shaking Ray Levis died quietly in his sleep, succumbing to heart problems that had been shadowing him for a couple decades. Working with co-founder and drummer Bob Stagner, and David Greenberger, they had just completed a new album, Tramps That Go Think in the Night on the tenth anniversary of their first collaboration, Mayor of the Tennessee River. As part of a two-night concert event celebrating Palmer's life and work in 2013, David and Bob were joined by bassist Evan Lipson and keyboardist Tyson Rogers for a performance. They debuted their new ensemble, David Greenberger and Prime Lens, at the Big Ears Festival in 2014 (festival founder Ashley Capps dedicated the three day event to the memory of Palmer and Lou Reed). Since it was Dennis who had brought them together in the first place, "and Prime Lens" is an anagram of "Dennis Palmer." 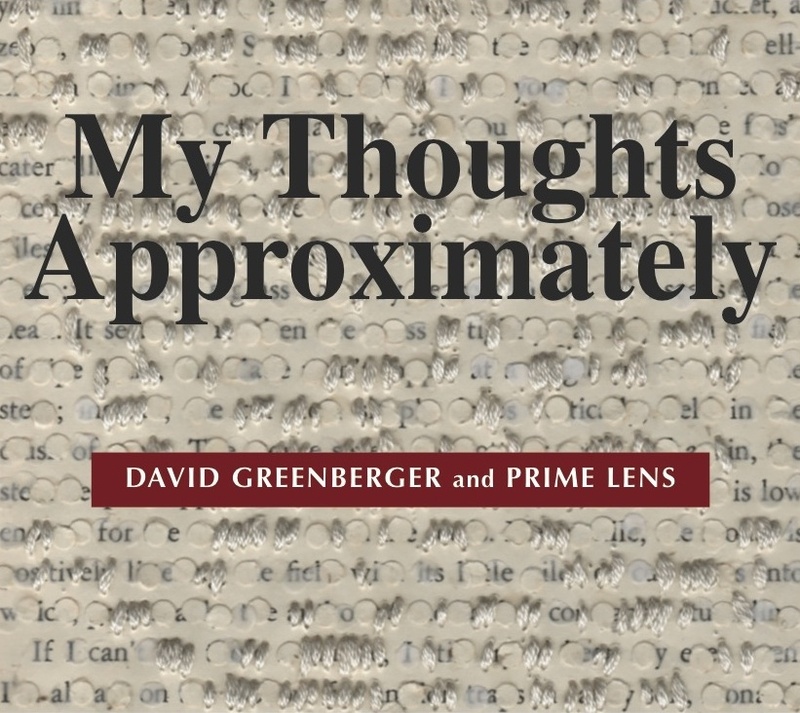 My Thoughts Approximately draws on four decades of conversations David Greenberger has had with elderly in various cities and circumstances, which are the starting point for the thirty emotionally, rich, character driven monologues. The recording sessions begin with musical ideas from the ensemble. Greenberger matches his text to the composition, allowing it to develop in the studio. Greenberger is best known for 32 years of his periodical, The Duplex Planet, which was borne out of his conversations with residents at a nursing home in Boston beginning in 1979. Over time monologues + music evolved, the elements working in tandem to form what he refers to as "a band with a guy talking." Over the years Greenberger has recorded and performed with a wide range of musical collaborators, including David Hidalgo & Louis Perez of Los Lobos, Robyn Hitchcock, Ralph Carney, Glenn Jones, Chris Corsano, Wreckless Eric, 3 Leg Torso, Terry Adams of NRBQ, and Birdsongs of the Mesozoic. He has created works for NPR's All Things Considered, California Council for the Humanities, Kohler Museum (Sheboygan, WI), Erie Art Museum, Center on Age & Community at Univ. of WI in Milwaukee, Third Coast Festival (Chicago), Arts at St. Ann's (Brooklyn), Portland Institute for Contemporary Arts, and elsewhere. Bob Stagner has been a percussionist, teacher, speaker, and leader in arts advocacy for thirty years. He co-founded the duo the Shaking Ray Levis, as well as the Shaking Ray Levi Society, an arts education organization that supports emerging artists in performance, visual art, and film. Stagner is the Southeast director of the Rhythmic Arts Project providing music workshops for people with disabilities. He has performed and recorded with a wide range of musicians, including Derek Bailey, Rev. Howard Finster, Wayne White, Bob Dorough, Vassar Clements, June Carter Cash, Tony Oxley, Fred Frith, Amy Denio, Shelley Hirsch, Col. Bruce Hampton, John Zorn, and Roger Alan Wade (with whom he tours regularly). Evan Lipson tours with Roughhousing (featuring Jack Wright and Zach Darrup). Past units include Normal Love, Satanized, Wrest, Dynamite Club, Psychotic Quartet, Femme Tops, and the Weasel Walter Trio. He has collaborated in performance and on recordings with, among others, Susan Alcorn, Mick Barr, Kath Bloom, Peter Evans, David Grubbs, Col. Bruce Hampton, Mary Halvorson, Konk Pack, Byard Lancaster, Pauline Oliveros, Jessica Pavone, Ruins (Yoshida Tatsuya), Shaking Ray Levis, Veryan Weston, Wolter Wierbos, Davey Williams, and Nate Wooley. Pitchfork magazine called Tyson Rogers a "wayfaring keyboard wrangler" for his multi-faceted abilities as a recording and touring musician. Tyson toured extensively with bluesman Tony Joe White and country legend Don Williams, playing on his Grammy nominated duet with Alison Krauss, "I Just Come Here for the Music." Tyson's original music has been featured by National Geographic, The North Face, and Tom's Shoes. His recordings have received critical acclaim, earning "Best CDs of the Year" by Downbeat magazine and others.